A strong, durable, modular concrete form system that is designed to withstand concrete loading pressure of 1,000 PSF @ 2:1 FS. The 1/2" (13mm) thick HDO Plywood Form Face produces a smooth concrete surface by minimizing deflection. Plywood edges are factory sealed to protect against moisture penetration. Over 100 Concrete Form Panel and Filler sizes available that will satisfy formwork engineering for almost any concrete structure with ease and economy. Forms are easy to erect and dismantle by hand... or may be field assembled to any gang form configuration with available gang hardware, then handled by crane when multiple repeat forming is required. Easy to use and maintain, easy to store and ship, this system is the popular choice of concrete professionals. 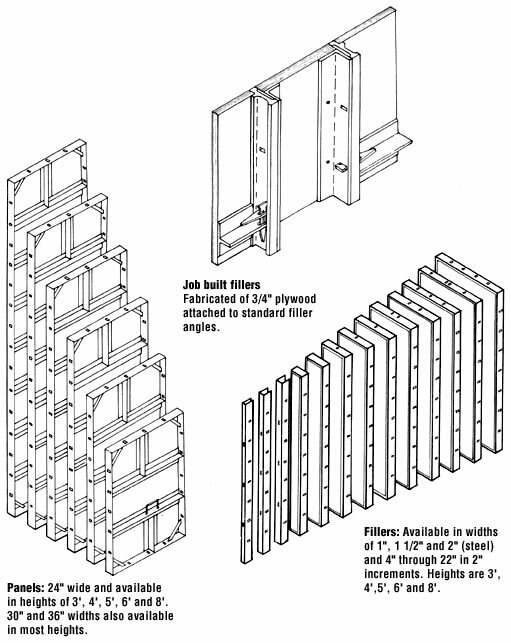 In addition to the 24" width Form Panels, 30" and 36" Form Panels are also available....in heights to 10'-0".